That radiation graph is interesting. Penetration of the atmosphere is a bit different to the penetration of a substance that I looked at, but still applicable. That is a very large split at the boundary between ultra-violet and visible light. Also a strange curve in the infra-red and microwave regions. I wonder what is causing that? Could be some interaction with Earth's charge field (magnetosphere, ionosphere, etc) or even air molecules and other atoms in the atmosphere. That is what makes this different to penetration of a single substance, the atmosphere, or near-Earth environment, contains many things and they all need to be penetrated to reach the surface. 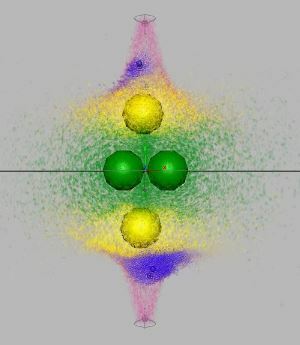 Regarding internal "bouncing" of charge photons in a proton, neutron, or electron's boundary, I think it's important to keep in mind that ambient (incoming) charge photons don't necessarily have to collide or bounce off our chief larger particle form, but may also collide with and bounce off each other. In most cases, the larger particle is essentially swimming in a sea of charge, and given the size difference alone we're talking about a great many photons inhabiting that volume at any given timeframe. Trillions? Quentillions? Since the larger particle's boundary-path creates the potential for more charge coming in N and S and less around the equator, it seems like the proton would be churning through a not-quite sparse "sea" of charge. It's tossing out 19x its own mass per second in charge photons - so if we wanted to do some math, we could probably even calculate how many (on average) photons it is pushing out in that second, which should be a pretty vast number since the mass difference is so great. If we can find that number I can easily illustrate it, at least as a still frame. There is no upper limit to how many particles we can draw; it just takes longer to simulate as you increase the quantity. Point being, since we have these potentials and all these photons being "focused" into these volumes, it seems to me the likelihood of charge photons colliding with each other should increase inside the larger nucleon. So if these internal photons tend to collide more inside the nucleon, we have a bit of recursion that has no need to strike the actual nucleon itself. I believe Miles' paper about the neutron for example talks about this; the neutron's charge path is slightly longer than the proton's, so it tends to take longer for a photon to enter the neutron and emerge, on average, compared to the proton. In my opinion, that's the chief difference between nucleon-sized particles and those below. Below the electron, there's not enough volume for a great deal of recursion, perhaps? And above the proton, there's TOO much recursion of ambient charge and thus the nucleon particle gets despun, much the same way that the neutron "decays" outside the nucleus?